Best known for her abstract and figurative paintings of seaside views and butterfly-dotted landscapes, Laure Bury's artwork has been influenced by her globetrotting life. Having lived in France, Mexico and Spain amongst other countries, her work is strongly informed by a sense of space, and the beauty she finds in her surroundings. View and purchase our collection of Laure Bury paintings here. As an art columnist as well as an artist in her own right, Laure Bury has a broad appreciation and understanding of her medium. 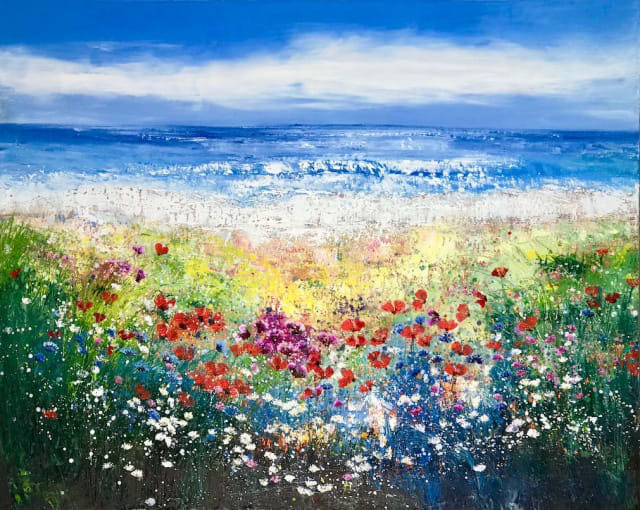 Based in Dartmoor, Devon, Bury has had her work exhibited across Europe, and her vivid paintings have been purchased by private collectors in the United States, France, Mexico, Spain, amongst other locations. Bury takes inspiration from the natural world she has found around her in the various places she has lived. Her colour palate is a vibrant one, and her use of contrast also reflects the differing countries and cultures she has experienced, from the rich, warm reds and yellows of Spain and Mexico to the pastoral greens and blues of her native Devon. Outside of her painting, Bury engages with the art community through a series of volunteering and workshop projects in venues such as schools, theatres and museums. This allows her to share her passion and knowledge for art and bring her interests to new audiences. Bury also donates a percentage of her fee for every painting to charitable causes for underprivileged children around the world.